Wonder Materials: Graphene and Beyond has added several items to a new section of the exhibition, that opened in August 2016 and was featured on Advisor, called From now to the future. This section of the Wonder Materials exhibition looks at pioneering applications of graphene in the home and in tackling environmental challenges. Included are examples of invisible technology to make our everyday lives easier, such as flexible screens and wearable health monitoring that have previously been the preserve of science fiction. The graphene-enhanced condom samples have been donated to MOSI by exhibition partners the National Graphene Institute at The University of Manchester. The added graphene makes the condom material stronger and more elastic, which could lead to thinner and safer condoms in the future. The printed graphene biosensor has been donated by the exhibition’s headline sponsors, Haydale Limited, who with its project partners are working to develop a biosensor that could one day become part of a cost-effective, printed test strip for biomedical applications that can monitor drug toxicities on cells. Other items include a graphene light bulb – the first commercial application of graphene to emerge from the UK, a water filtration membrane that will make it quicker and cheaper to make sea water drinkable, and lightweight industrial fasteners that would make products easier to recycle. 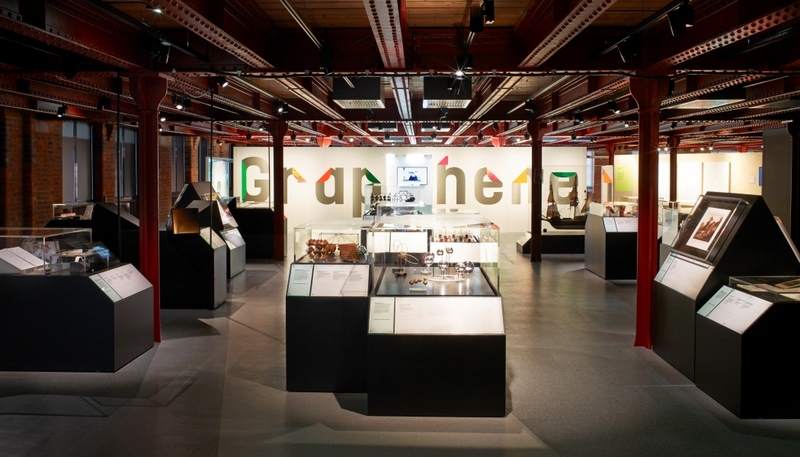 Wonder Materials is the UK’s first major exhibition on graphene and was launched as part of Manchester celebration of becoming the European City of Science 2016. First isolated at The University of Manchester through a process of creative scientific experimentation, graphene is one of the strongest, lightest and most conductive materials in the world. This ground-breaking show combines science, art and history to reveal the inspiring story of this amazing material. Made from a single, one-atom layer of carbon, graphene is invisible to the naked eye but has the potential to change the world in a host of areas from energy and electronics to healthcare and mobile phones. The exhibition runs until 25 June 2017 and admission is free.